Soon, you may have a close encounter with our Big Kahuna indoor – outdoor large bean bags. 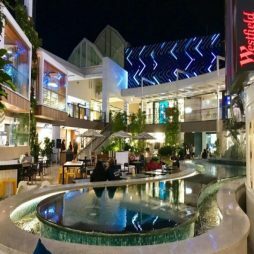 Westfields shopping centre in Warringah, Sydney, recently purchased twenty five commercial Big Kahuna outdoor beanbags in a range of fabulous colours, giving you the opportunity to indulge yourself as you enjoy a movie. Westfield Warringah Mall (previously known as Warringah Mall) is a large indoor/outdoor shopping centre in the suburb of Brookvale, in Sydney, Australia. In October 2016 the ‘new’ Warringah Mall was unveiled after being updated, modernised and designed with the customer’s needs in mind. Previously it had limited parking space, but the redevelopment has created 1000 more car spaces. The centre now has ‘living areas’ with plenty of casual seating. Combined with wide walkways, high ceilings, and a rain-forest feel, this centre really has been designed with the customer in mind. The new open air courtyard at Westfield Warringah Mall is the perfect setting for their new outdoor cinema. 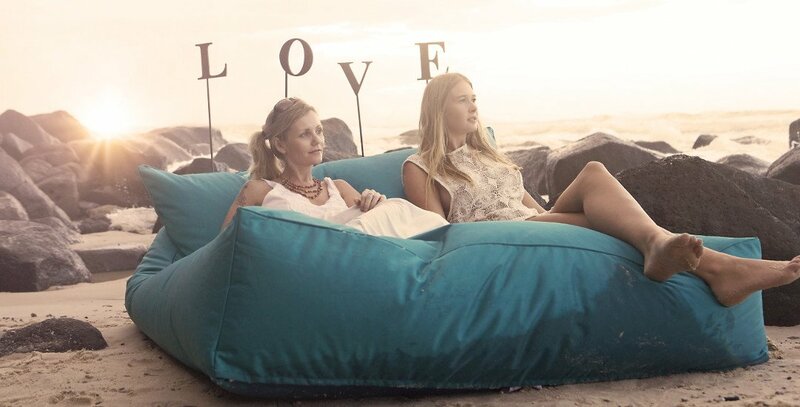 And what better way to enjoy a film than to relax with a friend in our giant Big Kahuna outdoor large bean bag, or be self-indulgent and lie like a starfish! At Resort Style Bean Bags, we are the manufacturer, we don’t just resell the same old Chinese made Bean Bags bought from Alibaba like many major bean bag retailers. We design our indoor – outdoor bean bags to provide unrivalled comfort, which is why major companies like Westfields choose our products. For the Westfield project, our commercial grade Big Kahuna large bean bag was the perfect choice. It’s a giant and robust yet stylish and comfortable lounger. The Big Kahuna’s incorporates solid back support where it’s most needed, but is even better when you lie back and rest your head to enjoy a film, or those fantastic summer rays. For relaxing under the stars, in the sun, or, in this case, watching a great movie, you can’t beat the Big Kahuna. It’s the most comfortable seat in the house, and its lightweight design makes it easy to be moved as needed. The stain-resistant high sheen cover makes it a breeze to clean. As we offer a range of fabulous colours, Westfield’s chose to go with 5 different colours. But these aren’t the only colours available. We have a stock range of colours (Turquoise, White, Apple Green, Purple, Black, Chocolate, Charcoal) available off the shelf, but we can also custom make any of our outdoor large bean bags in your choice of colour to complement your business design or home decor. If you prefer a slightly smaller lounger, our Kahuna is the perfect choice – or go smaller with a range that includes quality and comfort for individuals, kids and pets! Have your company logo printed on our range of outdoor beanbags for free advertising – your customers will love you for it. Contact us for more information about our exclusive products and branding options. What better way is there to promote your business with the perfect life-long marketing tool. Relax and see how comfortable our large bean bags are for yourself! We’re proud that our bean bags can be enjoyed at Westfields Warringah Mall. To enjoy a movie in comfort, visit the Westfield Warringah Mall for details. Or to enjoy the same comfort in your own home, why not check out our range of indoor – outdoor bean bags. This entry was posted in Bean Bags and tagged Big Kahuna, commercial, outdoor bean bag.